All the adorable moments you may have missed. In case you've been living somewhere other than planet Earth for the past few months, you'll probably be aware that today Prince Harry and Meghan Markle tied the knot in London! And, of course, there were an abundance of completely adorable moments. Here are the best ones. 1. The crowd cheered as Prince William and Prince Harry emerged from their car and walked, side by side, together to St. George's Chapel. 2. There was then this emotive shot of Meghan's car approaching Windsor Castle, passing thousands of well-wishers. 3. Inside the chapel, Harry looked a little nervous. 4. Meghan's mother also looked very overwhelmed by the emotion and grandeur of the occasion. 5. There was a completely adorable moment when the little bridesmaids and page boys arrived and made their way up the steps of the chapel. 6. Then it was time for Meghan's entrance. And this was Harry's face when he first laid eyes on her. 7. And this was Meghan's face when she saw him. 8. Harry said this to Prince Charles after he gave Meghan away. 9. Then Harry lifted Meghan's veil. When her face was fully visible, he said: "Hi!" 10. And then, Harry said this to Meghan. 11. As well as this. 12. 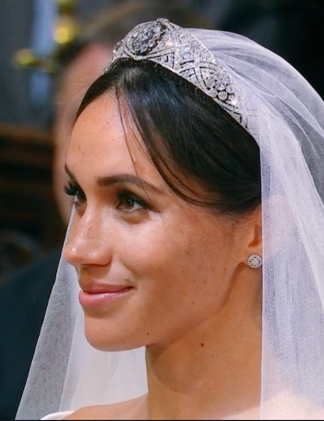 Harry looked over and smiled at Meghan as the priest spoke about them one day having children. 13. And they also exchanged this cute glance when the priest spoke about their future and life together. 14. They held each other's hands throughout the service. 15. 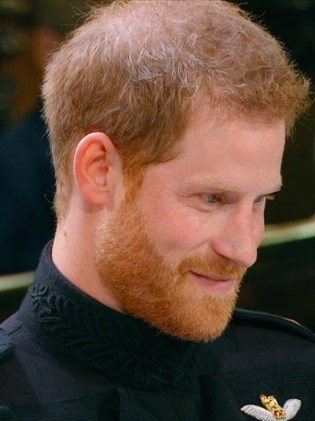 During the gospel's choir performance of "Stand By Me," Harry stroked Meghan's hand with his thumb and looked at her like this. 16. And just look at the way they gazed at each other as they exchanged their vows. 17. And then they stepped out of the church in the basking sunshine to awaiting crowds for the first time as man and wife. 18. They then surprised us all by sharing their first kiss as husband and wife on the steps of the chapel. 19. But eagle-eyed viewers spotted that Meghan asked Harry: "Do we kiss now?" before they kissed. 20. They looked unbelievably happy as they made the journey to their reception in an open-topped carriage. 21. Later in the day, they headed to their second reception looking like real life movie stars. 22. And, finally, in a lovely nod to Diana, Princess of Wales, Meghan was wearing an aquarmarine ring that belonged to her.